The Collaborative Bar Leadership Academy (CBLA) is an annual leadership academy for diverse bar leaders from each of the CBLA member organizations: the American Bar Association (“ABA”), Hispanic National Bar Association, National Asian Pacific American Bar Association (“NAPABA”), National Bar Association (“NBA”), National LGBT Bar (“LGBT Bar”), and the National Native American Bar Association (“NNABA”). Through this collaboration, the CBLA aims to strengthen the pipeline of diverse bar association leaders through leadership training and professional development programs. The CBLA benefits current and future bar leaders, the bar association community, and the legal profession overall, and lays the foundation for further collaborative efforts by the sponsoring bar associations to foster diversity and inclusion in the legal profession. This year's program will be in June 23-25, 2019 in Denver, Colorado. • Up-and-coming bar leaders who have been in practice for 5-15 years. • Have served in leadership role with an HNBA Affiliate or local minority bar association, or who have served as an HNBA Regional President, Deputy Regional President, or chair or co-chair of an HNBA committee, section, division, or task force. The application deadline for the 2019 CBLA is April 12, 2019. All accepted applicants will be notified to register by May 3, 2019. In 2013, the Hispanic National Bar Association (HNBA) launched an exciting and bold new program to increase Latino representation in the field of intellectual property law. In initial partnership with Microsoft, and now expanded to include other Corporate Fellows, the HNBA Intellectual Property Law Institute (IPLI)* is making a difference for Latino law students. Innovation is the lifeblood of the U.S. economy and IP law is an increasingly important factor in America’s future economic strength. Yet, statistics show that Latino lawyers are underrepresented in the field of IP law. The low numbers suggest a lack of understanding about IP law, a lack of role models, and a misconception about the skills and background needed to practice in the IP field. Six years ago, Latino IP attorneys were 1.8% of the profession, and with a 75% success rate, IPLI has helped increase those numbers. Up to thirty Latino law students from law schools across the country are chosen to participate in the HNBA Intellectual Property Law Institute, with airfare, lodging and meals covered. Candidates are selected to participate in this immersive summer program through a highly competitive process. NOTE: Anyone who has graduated from law school or will graduate before September 2019 is NOT eligible. The selection committee will select up to 30 participants on the basis of a number of criteria, including: an evaluation of expressed personal interest; academic record; dedication and commitment toward accomplishing goals; professional and faculty recommendations; and technical/scientific-related educational and employment background (if applicable). No one factor is dispositive. Students with no technical or scientific background are encouraged to apply. Even if you are working this summer, please consider discussing this opportunity with your employer. Click here for a letter from the IP Law Institute to submit to your employer explaining the benefits of your participation in the program. * The IPLI is a joint enterprise with the HNBA VIA (“Vision in Action”) Fund, the HNBA’s 501(c)(3) arm. Public Rights Project Fellows, David Ureña and Callie Wilson, will be hosting office hours for attorneys interested in learning more about the benefits and responsibilities of the Public Rights Project Fellowship! In 2018, David Ureña was accepted into the fellowship and placed in the Civil Rights Division of the Massachusetts Attorney General’s Office, while Callie Wilson was placed in the Community Lawyering & Civil Rights Unit of the Oakland City Attorney’s Office. During office hours, David and Callie will host a video conference to share their experiences with prospective candidates. It is important to note that this conference will not have any observation from the Public Rights Project Fellowship staff nor will it affect the selection process. Therefore, potential applicants are encouraged to utilize this opportunity to ask current fellows directly about how the Public Rights Project Fellowship has helped them to improve their legal skills, build upon their professional network and gain valuable experience working in public service. Interested attorneys can apply to the Public Rights Project Fellowship until May 15th, 2019. Washington, D.C. – As part of the April 1st National Census Day of Action, the National Association of Latino Elected and Appointed Officials (NALEO) Educational Fund today announced that it will join¡Hágase Contar! Campaign partners and elected officials for a series of events held across the country. A full list of events is available here. The goal of this year’s day of action is to educate the Latino community about the importance of participating in Census 2020. With Latinos now the nation’s second largest population group and one out of every six Americans, full and accurate data about the Latino community are critical for our country’s economic, social and civic well-being. Census data are crucial for our representative democracy – these data determine apportionment of seats in the U.S. House of Representatives and how district lines are drawn at all levels of government. These data also guide the allocation of more than $800 billion in federal funding to programs that are crucial to the well-being of families, including those affecting health, transportation, education and housing. Several challenges post a threat to a full and accurate count of Latinos in Census 2020, including the addition of the citizenship question, a climate of fear and distrust in the government, a lack of adequate funding for the Census Bureau, and a shift to the internet as the primary response option for the first time in history. In the lead up to Census 2020, NALEO Educational Fund is calling on the Latino community to pledge to get themselves counted. Supporters can sign the online pledge to participate in Census 2020 atwww.naleo.org/censuspledge and follow the April 1st National Census Day of Action activities on social media by searching #HagaseContar. Led by NALEO Educational Fund, the ¡Hágase Contar! Campaign is a nationwide effort to achieve a full and accurate count of Latinos in Census 2020. Additional information is available atwww.hagasecontar.org (site launches April 1, 2019). -Periods 5 11:15 am-12:00 pm. EBC is located at 1155 Dekalb Avenue, BK, NY 11221. If you are interested in participating and/or would like more information please email: Ronny Enriquez REnriquez3@schools.nyc.gov. The United States Court of Appeals for the Second Circuit is accepting applications for the Court’s Pro Bono Appellate Mediator Panel. The Pro Bono Appellate Mediator Panel is authorized by Local Rule 33.1, and is governed by the Second Circuit's Pro Bono Appellate Mediator Panel Plan. Members of the Pro Bono Appellate Mediator Panel serve as volunteer mediators for counseled, civil appeals. All applicants must be attorneys admitted to, and in good standing with, the Bar of the Second Circuit or the bar of a state within the Second Circuit. Applicants must have 10 years of legal experience and substantial mediation experience. As explained in the Pro Bono Appellate Mediator Plan, the Panel's size is limited; therefore, the Court cannot appoint every qualified applicant. Membership will be on a three-year rotational basis, subject to a limit of two consecutive terms. To apply, please submit a cover letter, resume, and this application to the Director of the Office of Legal Affairs and the Chief Circuit Mediator via email to volunteer_mediation@ca2.uscourts.gov. Applications must be received by May 1, 2019. Please use the subject line: Appellate Mediator Panel. Housing Conservation Coordinators (HCC) is seeking attorneys to volunteer at our Monday night legal clinic. Attorneys admitted to the Bar of New York and in good-standing are eligible. We are seeking a volunteer attorney for each date marked "open." Your help is much appreciated. Any New York City resident can visit HCC's legal clinic, regardless of income. Our volunteer lawyers explain basic legal rights and often refer visitors to other legal resources/agencies around New York City. The questions are primarily about housing and housing-related legal issues. However, while most visitors come for advice on housing-related matters, attorneys may field questions about other basic legal matters as well (employment, contracts, immigration, family law issues etc.). The Clinic is for 15-minute, informational consultations only. Visitors do not retain the volunteer attorneys. The clinic starts at 7:00pm and ends roughly at 9:00pm (often earlier, depending on the number of visitors). To keep the clinic manageable, signup is limited to eight visitors. HCC's office is located on 10th Avenue between 52nd and 53rd Streets. 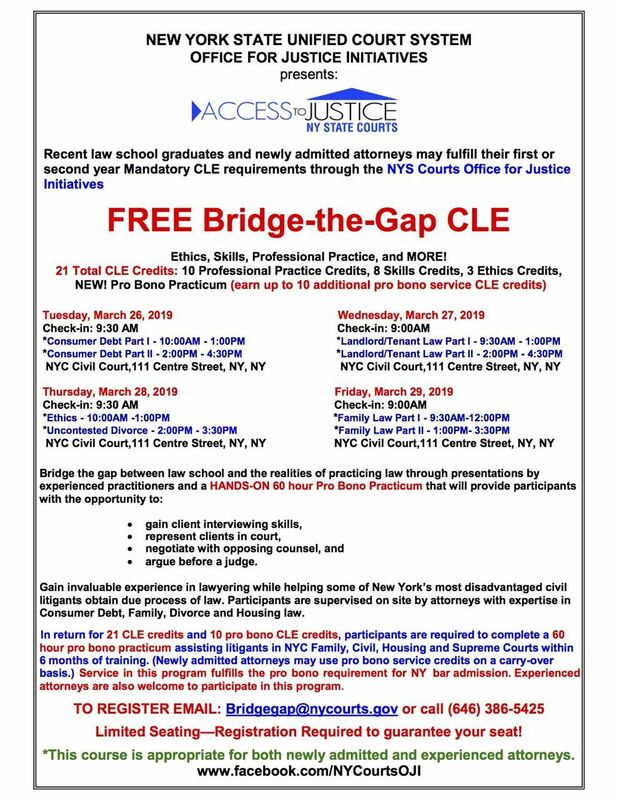 Both new lawyers and experienced attorneys are welcome to attend and are awarded up to 21 free CLE credits (in addition to 10 pro bono CLE credits) in return for service in the Court’s pro bono programs.